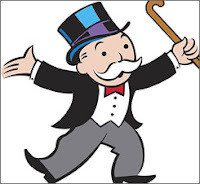 Maria Energia: Monopoly Adds Renewable Energy! This is awesome: A new version of Monopoly is coming out this fall called "The World Edition." Besides featuring global cities on the board, the Water Works and Electric Company spaces are going to be replaced with "Wind Energy" and "Solar Energy" utilities. Ahhh progress! That's awesome. Even in the most random places you can find a way to incorporate positive environmental messages. What great news! Did you know that BP co-created a "SimCity" game that features lots of renewable energy technologies -- with BP logos of course. If you're interested in the most current executive-level education on renewable energy in the "real world," you should check out the Renewable Energy Finance Forum-Wall Street (http://www.reffwallstreet.com), held in NYC on June 18-19, 2008. Last year, 40% of attendees were CEOs, CFOs or Managing Directors of renewable energy investment companys.